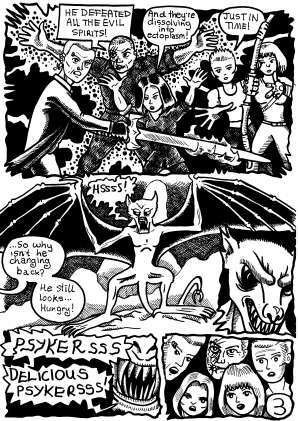 Marc, Cassidy, Sandy, Sophie and Ludmilla face off against the demon god Akhkharu. Seeing Sandy as the greatest threat because of her command of the ancient magick, Akhkharu quickly takes her out of the fight. Cassidy tries to heal her. The Akhkharu mind-controls Ludmilla, and Sophie tries to stop her from shooting Marc in the back. The Hunter faces the Blood God alone and is soon ensnared by tentacles. No matter how many he cuts off, more come to envelope him. Both of his feet are torn off, forcing him to use energy to regenerate. Then Sandy wakes and starts casting her much needed banishing spells. Marc throws Raven�s sword into Akhkharu�s eye. Then Sandy releases the Blood God�s hold on the dreaming and he starts to sink back into the chthonic abyss from whence he came. But he tries to take Marc with him. Only the psykers� combined efforts save him from the eternal darkness. But he has exerted himself too much and cannot continue without blood. Sophie agrees to let him have some of hers and he recovers. However, the group soon realise they have no way of getting home. They agree to wait for a few hours to see if Lothar will return for them but he doesn�t. 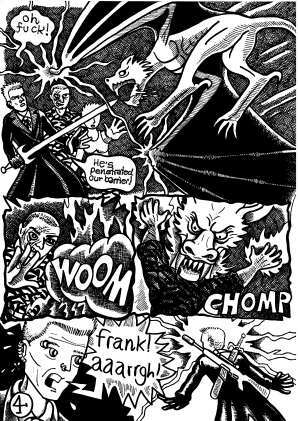 Then, just as they�re about to leave, a white wolf arrives and transforms into Vincent Knight! (See Jaeger #2-3 and 10-12) He has been given a quest to rescue them, but he is also supposed to ask them if they�ll help the Grey Howlers in their fight against Arthur Rochester and his demon hordes. They agree. ©Owen Nicholls 2001. Last updated 10th May 2010.